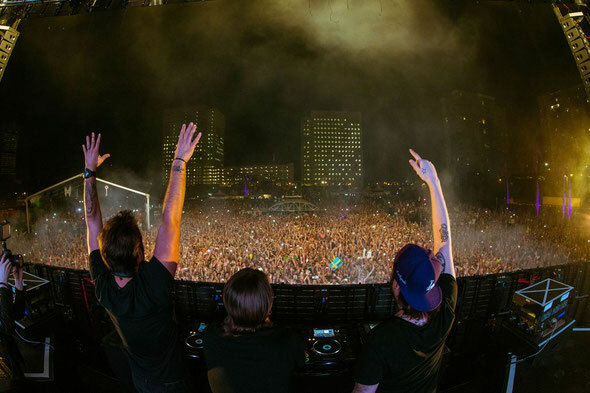 In December 2011 Swedish House Mafia became the first electronic dance music artist to headline (and sell out) the famed Madison Square Garden in New York. In March 2012 at Miami Music Week they brought Masquerade Motel to downtown Miami and sold out all 20,000 tickets for the two-day event. Now, for the first time, Swedish House Mafia headlines the main stage of the Coachella Valley Music & Arts Festival on Friday’s April 13 and April 20.
youtube.com/coachella. It will be an epic close to the first day of Coachella as Swedish House Mafia gets the desert jumping with its biggest and most ambitious production yet. They’re preparing for a busy summer with a slate of European shows including a headlining show at Milton Keynes Bowl, dates at Ibiza Ushuaia, Tomorrowland and more. Check the Coachella link for exact times, but European fans will probably be looking at a Saturday morning / noon streaming time.